Lee Mullican is a seminal figure in the development of postwar art, particularly for the manner in which he retrofitted surrealist technologies for use in the yawning expanse of the American Southwest. Although he came to prominence in an era when medium-specificity and a signature style would have provided an easier path toward commercial success, Mullican chose to travel, teach, and constantly seek out new ways of engaging with the flux that he encountered outside of the studio. Mullican left behind a vast and varied body of work that is a testament to an individual who used art as a means of uncovering a mystical synthesis between matter and spirit. 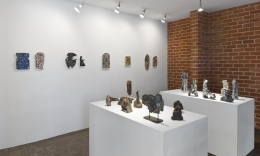 Shatter Special is built around a selection of ceramic works produced in the Croton Falls studio of Ailes Gilmour, sibling of Isamu Noguchi, in the 1960s and works produced in Mullican's residence in Taos, New Mexico, from the 1970s-1990s. Included in the exhibition are projections of computer drawings, which were produced on an early computer (IBM5170 PC AT and Summagraphics Summasketch) at UCLA in the mid 1980s. Additionally, slide projectors display a suite of Mullican's abstract photographs taken in Point Lobos and a group of structural photographic experiments. 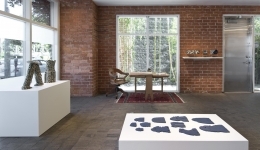 Curated by Ryan Good, director, Estate of Lee Mullican. This exhibition was made possible by the generous support of Marc Selwyn Fine Art and the Estate of Lee Mullican.